Words matter. It's not only what you write but also how you write it that affects others. Words shape our perception of reality. They stir emotions both good and bad, and they invite action as well as inaction. This is true in a variety of settings, and health care is certainly no exception. In fact, a recent study conducted by researchers at Johns Hopkins University School of Medicine found that the words providers document in patients' medical records affect how other clinicians perceive and ultimately care for those patients—and not necessarily for the better. "I think sometimes we consider the medical record as a collection of objectively recorded data and plans, but when you step back it becomes clear that you can really shape the narrative about a patient in very different ways, both implicitly and explicitly," says Anna Goddu, MD, lead author and a medical student at Johns Hopkins University. The study, which included responses from 413 physicians-in-training at an urban academic medical center, found that exposure to stigmatizing language caused providers to have more negative attitudes toward patients and treat their pain less aggressively. Researchers defined stigmatizing language as verbiage that casts doubt on a patient's pain, portrays the patient negatively using irrelevant or unnecessary indicators of poorer socioeconomic status, or implies that the patient is responsible for his or her own uncooperativeness with treatment. To conduct the study, researchers created two vignettes written as patient chart notes—one using stigmatizing language and the other using neutral language—to describe the same hypothetical patient with sickle cell disease. Researchers chose this diagnosis because of the implicit bias that some patients with this disease may exhibit drug-seeking behavior. In both vignettes, the patient presented to the emergency department with a vaso-occlusive crisis requiring pain medication and oxygen. Participants read only one of the vignettes and subsequently selected pain medication dosing from among multiple-choice options. They also completed a survey assessing their attitudes toward the patient. The results of the study were published in the May 2018 edition of the Journal of General Internal Medicine. Goddu, who likens physicians to storytellers, says even subtle nuances in documentation can affect how providers respond to patients. "All people are moved by stories, and medical records are stories," she says. "It's not a bad thing that we spin a story—for example, it helps us refine our differential diagnoses—but we need to know how we're spinning it and whether it's the best way to direct the patient's care." For example, the vignette with stigmatizing language indicated that the patient was "hanging outside McDonald's where he wheeled himself around more than usual and got dehydrated due to the heat." The vignette with neutral language omitted the reference to McDonald's, a restaurant that some may associate with unhealthful food and bad choices. "There's something about this detail that can plant a seed in someone's mind about who this patient is," Goddu says. However, as with any story, there's always more than one side. Goddu notes that the reference to McDonald's could also provide context for understanding the patient's economic status, a factor that might affect his or her ability to comply with medication and treatment. "We can't say, 'never use this language,'" Goddu says. "That's not at all what we're concluding or trying to imply. Rather, it's about asking yourself, 'What is it that I'm trying to say about this patient and how will that contribute to his or her plan of care?'" Kim Felix, RHIA, CCS, vice president of education and training at Intellis, agrees that the inclusion of certain seemingly unnecessary details might be deliberate. For example, what if the patient was dehydrated due to vomiting as a result of food poisoning after having eaten at McDonald's? "Sometimes this type of information could be relevant, depending on the patient's presentation," she says. Likewise, stating that the patient's girlfriend is "by his side waiting to go home" is different than stating "his girlfriend is lying on the bed with shoes on and requests a bus token to go home." The latter involves some degree of judgment, though it could also be an important detail when noted by a social worker trying to help this individual obtain transportation, Felix says. Sometimes it's not about what to include in the documentation but rather what you omit that can be stigmatizing, says Jane Hoyt, RN, CCS, CCDS, CDIP, supervisor of clinical documentation at UCHealth in Denver. For example, "Patient noncompliant with medication" vs "Patient is not able to be compliant with the medication regime due to lack of resources to drive to the pharmacy." The former implies laziness or even combativeness, Hoyt says, adding that nurses may subconsciously judge this patient or treat him or her differently without knowing the true reason for the noncompliance. Language that truly stigmatizes patients often stems from deeply rooted biases of which providers may not be aware, Goddu says. "The reason why we have stigmatizing language in medical records is due in part to the fact that we have deep-seated attitudes toward patients, some of which are easily recognizable and explicit and others that are implicit and very hard to recognize," she says. Stigmatizing language isn't a new problem, says LeighAnne Frame, CHDS, AHDI-F, president of the Association for Healthcare Documentation Integrity. "I've been in this business for 40 years, and I've seen stigmatizing language for as long as I can remember." Why the scrutiny now? It stems from increased awareness throughout the industry, from patient engagement efforts to greater access to medical records, Frame says. Documentation to describe patients with mental health conditions or chemical dependency can be particularly stigmatizing, she says. The same is true for obesity, a condition that may upset some patients even though physicians use clear clinical criteria when diagnosing it. "Clinicians need to be professional, but they also need to be able to write the real truth," says Jeanie Heck, CCS, CPC, CRC, director of education at Intellis. "The problem is that it may offend the patient." However, clinicians must be mindful when documenting about a patient who evokes an emotional response, says Frame, who provides the example of a psychiatrist who repeatedly refers to a patient who abuses his wife as a "jerk." "We would all like to believe that this documentation doesn't affect other providers, but I think that it does make a difference," Frame says. For example, other providers may not listen as closely or they may not provide an adequate amount of care, she notes. Experts agree that the presence of stigmatizing language can affect provider attitudes toward patients. Does this mean organizations should take steps to monitor and prevent this type of documentation? "Should they? Probably—especially if it makes a difference in how providers are treating patients," Frame says. "Will they? Probably not. It's very subjective. I think it would be very difficult to monitor this and do it effectively." There are other implications of stigmatizing language, Hoyt says. For example, should the case result in a bad outcome, documentation could be a liability if it reveals the patient was stigmatized or it doesn't clearly depict the patient encounter. Provide mandatory education for anyone who documents in the record. "There will be many who don't need this because they know better, but it will help the ones who are less experienced," Heck says. - Does my documentation further perpetuate stereotypes and biases in any way? - Does the information I've chosen to include directly affect patient care or could it be potentially relevant to another provider? - How will my documentation ensure that the patient obtains the appropriate care in a timely manner? - How will the patient feel or react if they read this documentation? • Use caution when copying and pasting information that could be stigmatizing. Clinicians can inadvertently copy that bias forward and amplify it in the patient's record for a long time, Goddu says. • Attribute information. Who is the source of the information? How might that individual's point of view affect the language used in the documentation? For example, does the patient describe him or herself as lazy or is it the physician's own conclusion? This helps put the documentation in a larger context for understanding, Felix says. • Be mindful of the subjective nature of other clinician's notes. "Physicians should always consider the validity of the physician's personal impression of the patient as it's communicated through documentation, just as they carefully consider another provider's medical assessment and plan," Goddu says. For example, take the case of distinguishing heart failure exacerbation from COPD in a patient who presents with dyspnea. Providers form their own opinions based on imaging, labs, and symptoms. "Ideally, you'd do the same thing with your general impression of the patient—what brought them in and what treatment should be available to them," Goddu says. Providers should also be aware of how another clinician's documentation affects their own perception of the patient. For example, a social worker documents that a patient is recently divorced after cheating on her husband. A physician reading that note may treat the patient differently if his own wife had recently had an affair, Hoyt says. "I don't think someone would do this deliberately, but we're all humans," she says. "You never know when a patient will strike a nerve." • Recognize internal biases. Most physicians don't intentionally use stigmatizing language. Help them understand that much of it occurs at a subconscious level, Goddu says, adding that after recognizing internal biases, physicians can work to change them. Engage patients. One of the most effective ways to raise physician awareness is to encourage patients to speak up when they read stigmatizing language in their own record, says Tammy Combs, director of HIM practice excellence at AHIMA. "If there is a concern, patients need to escalate those concerns to an office manager or their physician directly," she says. Patient empowerment is critical, Goddu says, especially for patients who may be powerless in other contexts, such as those without insurance, those who don't speak English, or those who are undocumented immigrants. Staff should help them realize they don't need to continue to seek care from a physician who continues to use stigmatizing language, she says. Create an atmosphere where staff members feel safe speaking up. This includes clinical documentation improvement (CDI) specialists who can alert risk management or quality assurance if they see language that may be stigmatizing, Felix says. CDI specialists already do this when documentation requires a more thorough review (eg, when a patient loses more than 2,000 mL of blood in the operating room), she notes. "The only problem is that stigmatizing language is subjective," Felix says. "It's not black and white. It's a slippery slope." Frame agrees that organizations can create an escalation process similar to the one that may already be in place for physician queries to help CDI specialists, nurses, and others bring caustic language to the attention of a physician advisor, medical director, or the chief of staff. "Then it can become a medical staff issue from peer to peer," she says. Hoyt suggests CDI specialists say the following when approaching physician leadership: "I saw this in the record and I think it's more subjective than it needs to be. Sticking to the facts is best practice." However, don't obligate CDI specialists to review documentation specifically for stigmatizing language, Felix says. "I think they have enough to deal with already," she says. Frame agrees. "Time is a factor," she says. "This would pull CDI away from all of the other important things they need to be looking at and finding. CDI needs to be focused on the accuracy of the medical record." Others feel different. "As nurses, we're trained to be patient advocates," Hoyt says. "We don't take care of patients at the bedside but we take care of their record. We always want to serve the patient. I feel driven to get the truth. I'd want someone doing that for me if I were a patient in the hospital. I do feel that this is our call to duty as registered nurses." Should organizations obligate CDI specialists to educate physicians directly about stigmatizing language? In Heck's view, this would be inappropriate. "CDI should stick to CDI. There would be so much tension if this was put on CDI. It can be adversarial between physicians and CDI already," she says. 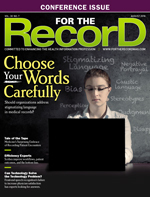 Frame agrees that educating physicians about stigmatizing language is beyond the scope of CDI. "We can't tell the physicians what they can and can't document. That's true for queries, and it's true for auditing," she says. What CDI specialists can do is help physicians differentiate between essential and nonessential information for coding purposes, Combs says. For example, stating a patient has "10 pain crises a year for which he typically requires opioid pain medication in the ED" is clearly different than stating that same patient is "narcotic-dependent and in the ED frequently." Both give the same information, but only one of them emphasizes the frequency of the ED visits and the patient's dependence on narcotics, Goddu says. Although some may view "narcotic dependent" as stigmatizing and judgmental, it's also information that's essential for accurate coding, Combs says. "As CDI professionals, we look at this very closely," she says. "It's important for us to know whether it's narcotic use, abuse, or dependence. Dependence can affect the treatment plan—and the coding." Furthermore, objective language can sometimes actually be insufficient for coding purposes; "typically requires opioid pain medication" is neutral, but it's also vague in terms of code assignment. "We would want to understand if that's just occasional use or whether it has advanced to dependence that requires more aggressive treatment," Combs says. In an era of patient engagement and greater access, physicians must be increasingly mindful of their documentation, Combs says. "Patients can shop around for their care and physicians need to make sure that the documentation is easily deciphered by everyone who reads the record—not just another physician," she says. Goddu agrees. "The fact that some physicians feel uncomfortable with the idea of OpenNotes suggests that there is an underlying awareness that we're saying things in our notes that are charged—that we worry about what patients will see," she says. "The movement toward OpenNotes and the emotion it evokes among clinicians highlights how subjective notes are, and it will bring awareness to this issue." This doesn't necessarily require more work for physicians, many of whom are already feeling the burden of increased regulatory requirements, Goddu says. "All they need to do is think twice about what they want to say and why they want to say it," she says. Editor's note: To read the Johns Hopkins study, "Do Words Matter? Stigmatizing Language and the Transmission of Bias in the Medical Record" in its entirety, visit https://link.springer.com/article/10.1007/s11606-017-4289-2.